Real-time trade reconciliation is essential to ensure that trades and orders are being reported correctly in both client and broker accounts. CurrentRisk is a platform independent reconciliation tool and position monitor that allows you to manage the entire life cycle of a trade in real-time. This is done by collecting data from prime brokers, liquidity providers, bridge providers and trading platforms, all while being displayed in a clear and easy to use format. The Trade Monitor matches all relevant parameters of each front end trade with those of the corresponding back end trade. Any mismatch, be it on trade parameters or a missing trade altogether, is displayed so that it can be investigated and resolved if needed. 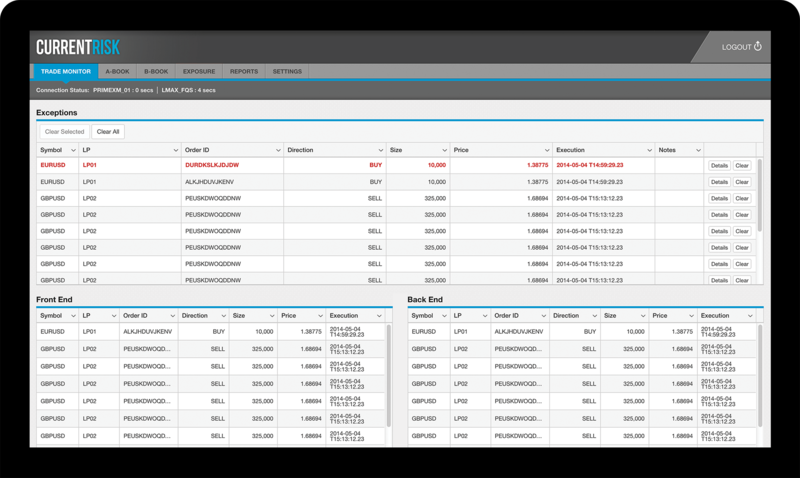 The Exposure Monitor allows brokers to see and manage portfolio exposure on a per asset basis. Quickly know if you are over exposed on any asset and save valuable time when resolving exposure. CurrentRisk collects trading data from all connected providers and generates advanced execution reports. Receive detailed statistics for liquidity providers and answer client execution complaints accurately. Simultaneously match net positions at multiple liquidity providers and prime brokers with the net positions on trading platforms. Differences are displayed clearly so that brokers can monitor and quickly address exposure. Match B-book positions with risk parameters the risk manager enters, on a per position basis. These include Max Long, Max Short, Max Profit, Max Loss. Once a parameters is breached the risk manager is alerted via visual, audio, and email alert. Visual and audio alerts are triggered when there is a trade exception, position exception, or a connection issue. In addition, email warnings are sent to end users if there is a connection issue. We are able to monitor our a-book positions and receive real-time alerts when potential exposure has been detected allowing us to cover the unwanted risk extremely fast ensuring minimal exposure. We highly recommend CurrentRisk.